So Leo’s post got me thinking about the pathophysiology of hypercalcaemia-induced polyuria. I wanted to share what I have learned in relation to the mechanisms of this phenomenon. Calcium-sensing receptors (CaSR) are found on the basolateral membrane of the cells of the thick ascending limb of the loop of Henle. Binding of calcium, with subsequent receptor activation, appears to induce a downstream message to close off the luminal K channel. This in turn inhibits potassium recycling and thereby shuts off the NKCC2 cotransporter, leading to decreased reabsorption of sodium, potassium and chloride in this segment. Following on from this, the medullary concentration gradient is diminished, leading to an inablility to concentrate urine and subsequent polyuria. CaSR are also found on the luminal surface of cells in the inner medullary collecting duct. Activation of these, in the setting of increased distal calcium delivery, down-regulates AQP2 expression, again resulting in an inability to concentrate the urine. Finally, there may be hypercalcaemia-induced PGE2 production in the thick ascending limb, which can further inhibit sodium chloride reabsorption. Thankfully, the polyuria and concentrating defects associated with hypercalcaemia tend to regress with correction of the calcium levels. One caveat to this may be patients who have developed an interstitial nephritis (secondary to calcium deposition in the medulla ) from prolonged hypercalcaemia. Although the term Post-transplant Lymphoproliferative Disease (PTLD) encompasses all lymphoproliferative disorders post transplant, it generally refers to extra-nodal B-cell lymphomas due to Ebstein-Barr virus (EBV) infection. PTLD is a B-cell disease caused by iatrogenic T-cell dysfunction: in people with normally functioning immune systems, activated T-cells regulate B-cell proliferation, whereas in the transplant setting pharmacological T-cell inhibition permits proliferation of EBV-infected B-cells. PTLD is the commonest post-transplant malignancy in children, the second most common in adults and is the commonest cause of cancer-related post-transplant mortality. 1. Polyclonal B-cell proliferation with malignant transformation, widespread disease, and multiorgan involvement. This accounts for 30% of patients and presents within weeks of transplant. You’re less likely to miss this presentation, as patients are often closely monitored during this time. 2. The majority of cases (over 50%) present as an infectious mononucleosis within a year of transplant. This is due to a benign polyclonal proliferation of B cells. This is easily missed, which is a tragedy as this presentation is very responsive to lowering immunosuppression. 3. A minority present late with a monoclonal B-cell proliferation, extra-nodal disease, and visceral involvement late post-transplant. Of the remainder, 60% developed EBV viremia and had their immunosuppression reduced; only 1 developed PTLD. This underscores how efficacious reducing immunosuppression can be. 6/20 with persistent viremia received rituximab; none got PTLD or lost their transplant. This needs to be replicated but is very encouraging. 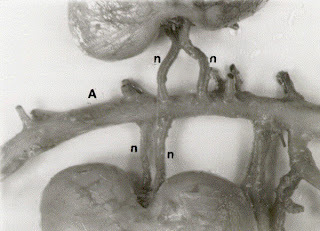 The graft is a commonly affected site. Isolated allograft dysfunction can be a presentation PTLD, as is allograft dysfunction developing after an increase in immunosuppression. Check EBV in all flu-like illnesses; doubly so if lymphadenopathy is present; triply so if during the first post transplant year. A 62-year-old man with CKD stage 3 secondary to presumed hypertension presented with new-onset hypercalcemia. PTH level was low at 11 and abdominal imaging revealed a right renal mass that later was confirmed to be a renal cell carcinoma. The most common cause of hypercalcemia of malignancy is secretion of PTH-related peptide, followed by increased bone resorption due to bone mets and increased 1-alpha hydroxilase activity by the tumor (similar to granulomatous disease). His workup was remarkable for iCa 6.3, total Calcium 11.5, PO4 4.6, ACE level 36 and alk phos 109. Negative SPEP/UPEP, no elevation of 1,25 vitamin D and a mildly elevated PTHrP 49 pg/mL (14-27). One interesting aspect of PTHrP is that the most common assay measures the carboxy-terminal fragment, which is usually removed by the kidney and might be abnormality elevated in renal insufficiency. On our patient, his hypercalcemia (~11-13) was associated with worsening renal function and creatinine peaked at 4.3 mg/dl. Despite hydration and ibandronate 6mg IV, his hypercalcemia persisted at ~11-12 mg/dL (72 hours afterwards). For further workup, another assay was performed with the amino-terminal fragment of PTHrP and revealed a low value (0.8). Lastly, there was no evidence of metastasis on bone scans. So what was the cause of the hypercalcemia in our patient and how can we get it under control? Solid tumor cells are believed to secrete other bone-resorbing factors that mediate hypercalcemia through increased production of prostaglandins E (PGE). PGE is a potent stimulator of bone reabsorption in vitro and there is both animal and human data suggesting that PGE is an important contributor of hypercalcemia in some malignancies. The most interesting aspect of it is that treatment involves administration of NSAIDS, which can block the production of PGE and resolves hypercalcemia. The original paper dates back to 1975 at the NEJM and there has been not many reports after that. 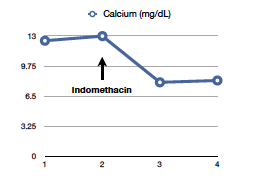 Nonetheless, the team taking care of the patient started him on indomethacin 25mg q8hours as a last attempt to control his calcium before removal of the renal mass was performed. The results were astonishing as you can see in the graph above. So despite all the negative effects of NSAIDs in the kidney, we have now a legitimate use in certain patients that have hypercalcemia 2/2 malignancy. Few questions still remain: how common is PGE-mediated hypercalcemia? Should we be checking for PGE levels as part of the workup? It seems that in patients that are not being considered for surgical resection and that did not respond to biphosphonates, a trial of NSAIDS could be warranted. Especially since the response is so quick! Please share your experience as well since this was truly the first time I heard of this correlation. Kudos to the team taking care of this patient (led by Dr Mount) and Omar's grand rounds' presentation. 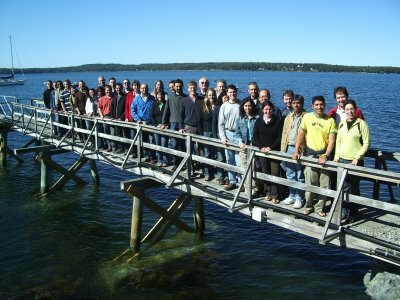 Places are still open for renal fellows to join the Mount Desert Island Biological Laboratories, near Acadia National Park in Maine, for this 1 week course. Taught by nationally prominent renal physiologists (who are also superb teachers), trainees perform classical and cutting edge experiments using mostly marine models, and share their results with each other in joint laboratory meetings. Each trainee participates in three of the seven modules, and hears about all modules at the lab meetings. As a result, trainees develop a thorough understanding of the physiology of the nephron, from the glomerulus through the collecting duct. The course provides researchers with a broad perspective on renal physiology, and, by linking basic physiology to clinical nephrology, helps future educators to become better teachers of clinical nephrology. The course has run 4 times, and has received extremely favorable reviews from all who have taken it. Nate and Matt both took the course blogged about it here, here and here. For those of you who have not taken the course, you can apply here. I had a breakthrough with my iPhone 3G camera. I've tried unsuccessfully several times in the past to take pictures of urine microscopy fields through the lens of the microscope and had just about given up until I came across this NEJM letter to the editor that claimed it was doable. The trick is to hold the lens of the camera phone about half a centimeter to a centimeter away from the eye piece. I found I needed to turn the intensity of the microscope light source down quite a bit to avoid whiting out the image. It's a little tricky getting the field into focus but with a little practice is completely doable. Above is an image I took of a granular cast in a sea of non-dysmorphic rbcs from a patient with ATN and foley trauma. As pointed out by the letter to editor one can take video to scroll around the slide so you can show your attending, housestaff or primary team who weren't there with you what the urine microscopy looked like. Labels: Graham Abra, medical education, nephrology education. Multiple renal arteries and hypertension? A woman in her 30's presented with five years of severe hypertension, uncontrolled on trials of four or five agents over the past few years. She had had preeclampsia nine years ago that resolved after delivery, and for the next four years she was reportedly normotensive. Her hypertension had been diagnosed five years ago when she developed disabling headaches. Despite attempts at medical control, she continued to have systolic BPs over 200 mmHg, and diastolic BPs over 100 mmHg. In the past year, she had been hospitalized several times for syncopal episodes. Each time, her BP on arrival in the ED was >200/100. Cardiac and neurologic workups were repeatedly negative. According to the patient, she had had numerous urine and blood tests, which failed to yield an explanation for her hypertension. She did not remember having a renal ultrasound, but said she had had a CT which showed "my kidneys were in the wrong place". Workup in our clinic included normal renin and aldosterone levels (even on an ACEI, which should have increased plasma renin/aldo), and normal plasma metanephrines, VMA, and cortisol levels. She was not on oral contraceptives. Creatinine was normal, although she had trace urine protein on dipstick. Renal CT angiogram is where things got more interesting-- she had a single pelvic kidney, with duplicated renal arteries and a third, accessory artery coming off the aorta to supply the posterior aspect of the kidney. There was no evidence of arterial stenosis, and no hydronephrosis. Her adrenals appeared normal. I must admit, I am a little stumped about why this woman has such severe hypertension. However, I came across a possible explanation while doing a literature search, and wanted some feedback from this readership. Could her anomalous renal arterial anatomy have something to do with her high blood pressure? 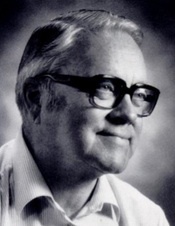 In the 1950s, several autopsy studies suggested that persons who were hypertensive were much more likely than normotensive persons to have multiple renal arteries (somewhere around 70%). These studies were subsequently contradicted by several series of renal angiograms, which did not show an increased incidence of multiple renal arteries among hypertensive persons. Number of renal arteries and whether both kidneys were involved were not evaluated by most of the studies, nor was arterial length or diameter. It appears as though somewhere between 20 to 30% of the population has at least one additional renal artery, though the jury on whether there is an association with hypertension is still out. The thinking behind the connection is presumptively that narrower and/or longer accessory renal arteries have decreased blood flow compared to a single renal artery; hence, renin secretion is increased. While this mechanism might result in increased blood flow to a normal kidney in a person who has only one kidney with multiple renal vessels (and may downregulate renin secretion in the normal kidney), I wonder what the effect would be on my patient, with her solitary kidney. The problem with this theory is that her renin and aldo levels were normal. However, I'm low on other ideas. Please let me know what your thoughts are! I'm curious to know if anyone else has had experience with hypertension in patients with anomalous renal arterial blood supplies. 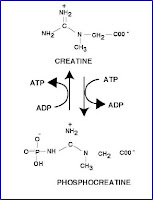 Creatine monohydrate is a widely available dietary supplement. It frequently pops up during both outpatient and inpatient discussions on the differential for acute kidney injury. However, the literature is scant and appears to be conflicting. So, here are a selection of some of the papers that have been published on this subject. Firstly, creatine itself is produced naturally in the body, mainly by the liver and kidney, and is transported mainly to muscle. It is involved in a complex interplay with phosphate to form phosphocreatine, facilitating a stable and rapid supply of energy on demand. 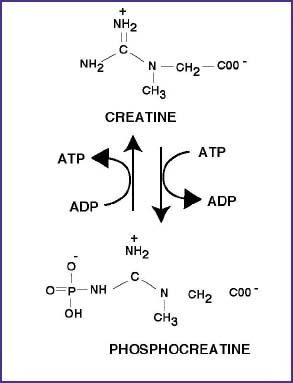 Creatinine (our common, but imperfect, clinical surrogate of GFR) is a breakdown product of creatine. One of the early reports of association of exogenous creatine with kidney damage was in 1998 - the case described acute on chronic renal impairment in a 25yo man on cyclosporine for FSGS, which was temporally related to ingestion of supplemental creatine (there was no reported change in proteinuria). Upon cessation of the supplement his serum creatinine returned to baseline. No biopsy was performed. A second case reported biopsy proven acute interstitial nephritis in a 20yo man, which occurred four days after ingestion of creatine supplements. Again, upon cessation of creatine the renal function returned to baseline. This review of the existing literature on creatine supplements, highlights the varying reported results of the effects of exogenous creatine on both CPK and serum creatinine levels, with some claiming no change and others claiming slight elevations. An interesting randomized, double-blind, placebo-controlled trial of 18 athletes looked at the effect of creatine ingestion (10 g/day over 3 months vs placebo) on cystatin C levels as an alternative measure of eGFR. The authors claimed that creatine caused no significant alteration in estimated GFR as assessed by cystatin C (in fact the cystatin C levels decreased). Overall, it would appear that we are still awaiting more detailed information of potential renal risk associated with exogenous creatine use. The trials to date are relatively small and longer term follow up is needed. As ever, a detailed exposure history and close vigilance is required, especially in light of the current popularity of alternative and supplement based pharmacotherapy. The American Kidney Fund is running an online contest to choose a winner in its 16th annual ‘Calendar Kids’ art contest for children with kidney disease. The winner’s artwork will grace the cover of AKF’s 2012 wall calendar. To see the what the kids have done and cast your vote click here. The child who wins the cover contest will receive an all-expenses-paid trip to Washington, D.C., to be honored at AKF’s annual gala, The Hope Affair, this fall. All 13 children who have been named finalists will have their artwork published in the 2012 calendar and will receive a netbook computer and an education savings bond. Voting ends on June 15, and calendars will be available for purchase on the American Kidney Fund website in October. Always use the ultrasound. You just never know what the anatomy is going to look like and real time guidance really increases the number of single pass lines. Every central line I placed in residency used ultrasound localization but then landmarks without realtime guidance for placement. Realtime ultrasound definitely helps. Lots of saline. It's great stuff. Really helpful if you're having a difficult time getting into the vein. The needle and syringe will sometimes become occluded with clotted blood from prior attempts. Flushing both the needle and syringe until the syringe plunger action is smooth helps avoid getting into the vessel but thinking you haven't because you can't aspirate due to clot. I like to keep the fresh and used saline pools separate so there's always some fresh saline handy. 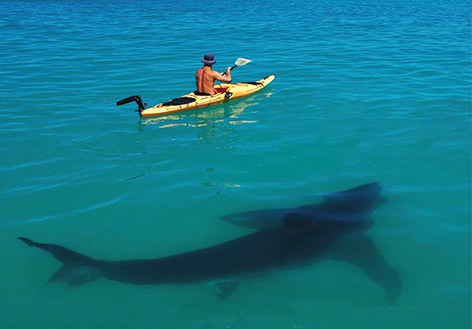 Making sure the needle is in the venous lumen. Taking the syringe off and confirming the blood is dark and nonpulsatile is key to checking that the stick isn't arterial. If it's venous and your proceeding I've found it helpful to slightly drop the angle of the needle (to avoid going though the opposite wall of the vein "through and through") and advancing it 5mm or so further to get the needle tip fully within the lumen. Sometimes, if just the bevel has gotten in just a slight release of pressure moves it out of the vessel and you can't pass the wire. Passing the guide wire. Not infrequently you'll be able to pass the guide wire to a point that clearly is beyond the tip of the needle and then encounter resistance (if it doesn't seem to have gotten past the needle tip you may be out of the vessel and need to start over). In the case of having gotten past the needle tip and then encountering resistance, sometimes flipping the circular plastic holder that houses the wire 180 degrees (which rotates the wire 180 degrees) will move the curled tip into a more favorable position and allow you to proceed. The skin incision. Key to a smooth initial dilator insertion is a large enough skin incision along the trajectory of the wire. I've found that holding the guide wire steady along it's natural exit trajectory and then making the incision along this same angle is very helpful. The cutting edge of the scalpel should be directed away from the artery (cutting edge facing medial for the femoral, lateral for the internal jugular). Trying not to kink the guide wire. Again, I've found that holding the guide wire firm and steady along it's natural exit trajectory then with the other hand advancing the dilator from as close to the skin as possible reduces the chances of kinking. If the wire does kink and you are unable to advance the dilator further, try pulling the guide wire back a centimeter or so while leaving the dilator in place. This will pull the kink into the dilator and then using the same techniques as above you can often complete the dilation. Lots of 4x4s. When the dilator comes out, lots of blood. Having a 4x4 ready keeps the field clean and minimizes blood loss. The catheter is in but now a port won't flush or pull back. Most catheters rotate freely in the wings used to suture them in place. If a port isn't functioning try rotating the catheter 180 degrees by twirling it in the wings, this will often move the distal port off the vessel wall and allow pull back and flush.